While checking out a link on one of my favorite blogs, How About Orange, I couldn't help but think,"Why hasn't anyone thought of this before?!" 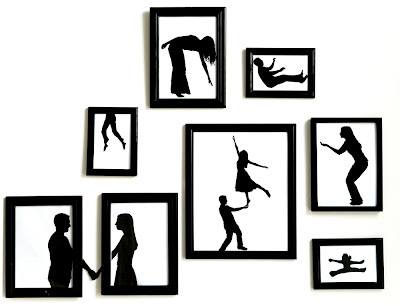 It's a simple idea, but so clever... wonderful, starkly framed silhouettes created by Brooklyn photographer and street artist, Katie Sokoler. I've mentioned my love of traditional silhouettes in past posts, but Katie's fresh approach captivates me because she's managed to lose the typical stiffness of profiles. It makes all the difference in the world to choose an action pose instead. Learn Katie's method of transforming your personal photographs via her tutorial at Time Out New York [edit: no longer available]. Her blog, Color Me Katie, is just as much fun as these silhouettes. I'm starting to follow you like a puppy dog, Ann! I love what you show! These are so simple yet stunning, and I love her blog! Those are really fun! I was planning on doing my mum some traditional ones of her grandsons I may have to change that now!